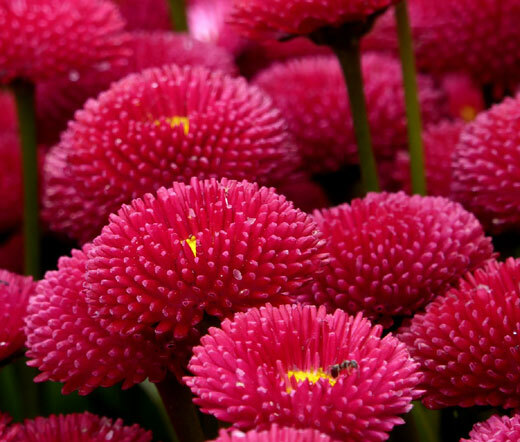 English Daisy Red Bellis Perennis Super Enorma is a popular perennial daisy for early spring bloom. This variety of English Daisy can be easily grown from seeds, and the established plant produces extra-large, bright-red flowers on a top of strong 3-5 inches stems. Bellis Perennis features basal clumps of semi-evergreen foliage and starts to bloom profusely in early spring. English Daisy is effective when planted with spring bulbs, and its blooming flowers attract butterflies. English Daisy Red is commonly used for mass planting, low borders and for underplanting tulips in landscapes. English Daisy is a long time favorite cottage garden flower and looks outstanding in rock gardens and containers. Bellis Perennis seeds need light to germinate, so the surface sowing is recommended. English Daisy grows best in full sun or partial shade and thrives in dry or moist well-drained soil; however, the plant does not tolerate combination of heat and humidity. Bellis Perennis performs as a perennial in colder climates, but this plant is grown as biennial in warmer zones.